New York’s decision to abort full term babies does not have as much to do with a woman’s reproductive right as it does with creating outrage. Outrage deferred metamorphoses into apathy. The more such apathy—which is actually moral shutdown because the cost of being moral is too painful to the comfort zone—the more evil they can get away with committing. In this case it is bringing our nation closer to arresting, torturing, or murdering citizens that do not agree with them. That is still a far fetched idea for some people. But they never thought they would witness a governor and presidential candidate stand arrogantly and smugly, and announce State-sponsored genocide of full-term babies. Until their heels leave the womb, those sweet and virtually the only symbols of innocence and purity remaining in our society, are in danger of being murdered. Instead of leaving the womb to be sheltered in a mother’s loving and secure arms, their glimpse of life will be terrifying, unbearably painful, and fleeting. How godless and animalistic does a human have to be to commit murder of a baby? How coldly brutal, Nazi-sciopathic, and dead to the natural instinct of love and protectiveness for a baby, must they be? Could such a one ever hold a baby with love and wonder? Would a baby instinctively shrink back in terror when they reached for him or her? Will New York employ Muslim terrorists to murder full-term American babies? Will they abolish the penalty for pedophiles and other child abusers? How can they convict and send a mother to prison for murdering her children when they would have done the job for her if she had asked them during her baby’s crowning. The paradigm they are following is the Hegelian Dialectic. They intend to push people with repeated outrage until they become as sheep, in fear of the powers that be and overwhelmed with a sense of helplessness. With each outrage not properly responded to, they can gage how weak and unwilling to respond the opposition is. Eventually, the Conservative faction will implode to avoid the immense stress of the reality they have avoided and can no longer hide from. The fact is, Christianity—the former bastion of morality—is fatally divided, rife with heretics and heresy, and leaderless—except for the showmen/entertainers that perform on Sunday morning and religious TV. The ones that recognize encroaching unprecedented evil have chosen to put all their effort into a vote every two years. Subsequently and consequently, the Democrat Party has become so corrupt that it has shamelessly brought our nation to the verge of moral desolation. They have removed their masks and revealed what they are and what they will do to Evangelical Christians and other Conservatives when they get back in power. They should be confronted about their wickedness at every turn. Professing Christians ought to rise up en masse, boycott, write letters, protest, pray, et cetera. If you—professing Christian—are ever going to listen to a warning it is now. If you are ever going to begin praying more than mumbling a few sentences on the drive to work, start now. Set aside a time to pray and you will quickly understand how important it is. You will immediately fight numerous battles. You will suddenly have many things to do. Distractions will flare up and crook their fingers, beckoning you to come away with them. It will be one of the most difficult things you will ever attempt. There will be no doubt that the minions of Satan are opposing you. Everything will suddenly become more important than prayer. Maybe that is why the old saints shut themselves in prayer closets—to shut out the diabolical noise and distractions. If you do not decide up front and make prayer the most important thing you do, then you will decide that you just don’t have the time to pray. Then you’ll remain in the barren and weak position as before. Are you really going to take that intimidation from the enemy of your soul? We may never understand prayer, why or how it works, and why we benefit so much from praying, but there is one thing that no one should have trouble realizing. That is, if it is so unnecessary, why is it so difficult to establish a faithful prayer habit? Why the great battle that prevents us from praying? I will be a witness for the great benefit of prayer. I know how it feels to be a near dysfunctional Christian because of short and rote praying. Cheryl and I rise early to pray at length and intercede for thousands of people. I do not state that braggadocio. It was a very difficult battle decades ago to establish that paradigm and is still a battle to remain faithful to it. The key is one’s mindset. Are you willing and will you confront your spiritual obesity, deny your indulgences, and pray? Finally, I know how difficult it is to begin, but here is a solution. Purchase a small notebook, write some things you wish to pray about and people that asked you to pray for them. List all your family, friends, co-workers, et cetera. List the heretics and corrupt politicians. Pray for the persecuted Church. Pray for your pastor and his family. Pray for our nations leaders, that God would convict the bad ones and help the ones on the side of good. Write down your spiritual and physical needs. If nothing else, pray for the babies at risk of beutal murder. Before you know it that little book will be filled and you will be spending much time in prayer, your spiritual eyes will be open and your spiritual ears will hear. Your inner person will awaken to reality you never knew before. Once you realize what you had been cheated out of, you will never go back. If there is any hope for Christianity and our society it is praying saints. If this is the Last-days, prayer is essential to endurance. Either way praylessness is certain defeat, and praying is an essential means to victory. Pray that God will judge and deal with the wicked individuals who voted for the so-called Reproductive Health Act (RHA). It actually has nothing to do with reproduction, but is a license to commit genocide of infants. In this period of cold-blooded and diabolical State-sponsored terrorism of babies, prayerlessness is a sin. You are so right. We have reached the abyss via that slippery slope. Prayer is the key weapon in standing up against this wickedness from the pits of hell. I was having an issue with my sleep last might. So, I got out of bed and made coffee and sat down with my laptop. I glanced at a few news sites and thought, ” I hate even going to look at the headlines”. I really do ! I looked at the weather and am trying to make up my mind on whether to cancel a weekend trip to Kentucky or go on down there on low energy. Then I went to Truthkeepers as I always do each morning and this article was waiting on me. What a wake up. I had seen a newsflash a couple of days ago about the N.Y. law and thought, “What has America come to?” So, lacking on my normal amount of sleep, I am starting to write my reply. I know one thing C.H.. I an going to commit to doing what you recommend about prayer. I have been feeling powerless and run down as I wait on the Lord to return and rescue me. Whether by rapture or death, I look forward to seeing Jesus. Thank you C.H. for writing these commentaries and standing in the gap for people like me and Barb. We are always encouraged by seeing you stand firm and keep sounding the alarm. You spur us on to fight the “good fight of faith”. What every Christian should do is call out the Christian Pastors in NYC (ie..tim Keller) and ask them where their outrage is on this…if the Catholics do so, why not the Protestants? Where are the NYC mega church pastors on this slaughter? Where is their righteous anger! Where are they? I wrote to TK, to Cuomo voicing my thoughts in writing. We should fill up their emails boxes with calls for them to repent before it is too late. This Cuomo “law” should be called the Cuomo-Gosnell law. That is exactly what we wondered. Where are the voices of the leaders of Christianity? They aspired to leadership, now it is incumbent on them to do their duty and rebuke Cuomo and his evil gang. One thing about this news item that sickened me is the way they were all smiling, the women too. It was demonic. Something I noticed often about people who do pray, is that it is often about petty, trivial things in their own life. Something they don’t need anyway, and probably shouldn’t have (like cable tv) broke down and needs attention. That is the scope of their concern. I could count the times on one hand when I actually heard other Christians praying about missionary work, persecuted Christians, the state of apostasy in the church today, or any of the other big issues that God has called us to focus on. Occasionally I have been at a prayer meeting that had one of these things as its theme (rare as that is now), but that is the only reason anyone is praying about it. When left to their own desires, such issues never get raised. It’s always about ‘my family,’ etc. And I’m not saying we should not pray about ‘our families.’ What I am saying, is that it should not just be about that. The locus of concern does need to stretch a bit more. Yes, the days are getting more evil, and that is exactly what they are headed for, you said it. 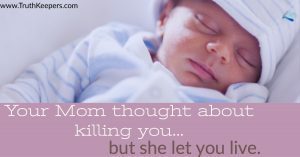 It never ceases to amaze me that they don’t think of abortion as murder. Let’s look at the following. A sperm and an egg is one thing. I don’t believe that preventing them from joining is murder. There are megazillions of each all over the planet right now that will never merge. But once an egg and a sperm join, a new life has begun. Conception is the beginning of life. Like a new leaf from a seed, that is when the cycle begins. And it will continue until the baby is born, lives out his or her life, and dies as an old person. That is the cycle. Unless someone intervenes with a pair of knives joined into ‘medical’ scissors to cut that life cycle at some point. Since that did not happen to any of us after being conceived, that is why we are here to read this post. Our lives were not snuffed out, we were not murdered in the womb, and our blood was not spilled on some medical lab table of butchery and massacre. Our body parts were not harvested for purchase by those with evil ogling eyes and devilish lusts. Others were not that lucky. And now a bloody massacre, a butchering murder of human life is swept under the rug by so many euphemisms such as ‘reproductive “rights” ‘. Give me a break. It is sick, disgusting, revolting, appalling, evil, and ghastly. And nothing less. It is murder of the innocents. They have blood on their hands, not only those who do it, but those who approve of it, and God will not overlook it. The window of time to repent is quickly closing. I live in another state that allows for late term abortions., murder of babies in the womb. I believe there are no restrictions. I have to educate myself on the difference between NY ‘s horrific law and the horrific laws of other states that already permit late term abortions., like Pennsylvania, where murderer Gosnell set up his shop of horrors. They all seem to use the phrase “for the health of the mother”, which, sad to say, is just another way of saying “whenever she wants to”. Pastor Carter Conlon of the Times Square Church spoke out against this evil. The name of the message was Pushing Back This Present Darkness. I thank God for the legacy David Wilkerson left in NYC . Yes, thank you for the information. I will listen to it soon. Good to hear he spoke. Thank God for Pastor Conlon. We listen just about every Sunday. I regret having to write this but I must try to be open and honest. I take back my endorsement of Carter Conlon and therefore also, Times Square Church. I just listened to part of Sunday Feb. 10 sermon and had to turn him off this time. He was on a rant of dogging out the apostle Paul. Building up Mark at the expense of Paul’s honor. I heard enough of those kinds of irresponsible and errant sermons to last me a lifetime in the decade of the 1990’s. I have wondered about Conlon for several years and now I know about the check in my spirit. No more for me of him !! This is definitely a time to pray, fast, mourn, and protest. I heard about how other states are adopting similar laws. I heard that they had lit up the trade center location in hot pink to celebrate this satanic sacrifice. I googled to see what else was going on about this. As it turned out they reported that a total of 5 pastors had publicly spoken out about this and first I thought in NY state, then saw that this was in the whole country! Not only that, but 2 of the five are total apostates, 1 is sort of half way there, and the other 2 I don’t know. This pastor at Times Square Church was not mentioned so it could be that the real grass roots opposition is not being ‘televised,’ but they are doing a publicity stunt for some of the wolves but something about it is fishy for sure. Then it turned out that one man (who was said to also be a pastor) and had a bookstore had closed it for one day in protest against this law of massacre. You can google for this info. But it was like ONE GUY. I googled to see if there were any protests and did not come up with any results (there may have been some small ones of course). There is however, something planned. A big pro life organization is calling for a national day of mourning on February 23 to fast, pray, mourn and repent over this issue and not do any shopping, etc. Just google for the details but I am definitely in on it! I’m just stunned that these things happen and everyone just goes on with ‘business as usual,’ ‘what’s the score,’ and the same apathetic attitudes everywhere including church. Where is the outcry of the church? That was my question and that was all that I found so far. Everywhere I look there is silence. The world nosedives into sin and the church is silent. The church descends into apostasy and the rest of the church is silent. American states are passing laws that allow for full grown babies at birth to be butchered, murdered, and sold for parts. Again, the church at large is silent. By ‘church’ here I mean actually anyone who professes to be a Christian. Heck, even nonbelievers should see that this is the worst kind of evil! I went to another church today and the sermon was actually pretty good. When I say that, it’s good. It could have been a post on this blog, it was that good. Rarely do I find that; a sermon that is ‘what the Spirit is saying to the church’ today. I wasn’t there last week because of a pro life thing elsewhere so I don’t know what was said about the passing of this law. But today it was like… nothing. The same stuff. People roll in late. People giggling during an earnest prayer. People horsing around in the pews. People all into their families sitting around together and ignoring God and His message. People texting during the sermon. And I did see that that’s what it was. And the way they dress and carry on. Barely anyone is truly singing and worshipping. After the sermon all they can manage to talk about is sports. Yet they may be some of the ones expecting this ‘great revival ahead’. They expect God to just pour all these blessings on them when they can’t even give Him an ounce of the reverence that He is due. What if God’s throne were there in front of them, would they still carry on as they do? Do they think His presence is there at all? Either they don’t or that’s how they would behave if they thought it was. I don’t know why they even bother going because it’s not for God. And no one is outraged, no mention of protesting this or praying and fasting. Just fun and games, what’s the score, and can you pass the popcorn? If a church would call for a day to pray and fast for things like this, they probably think everyone would be bummed out and leave. So let’s just schedule the fun and games events and keep the carnival going. And the silence continues.